It’s April and spring is “in the air,” however on days like this one it means torrential rain and wind. 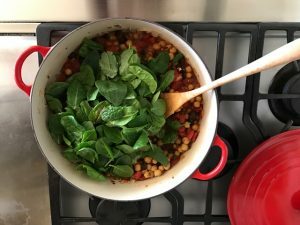 I suggest this comfort-food antidote – Mediterranean Chickpea Stew. 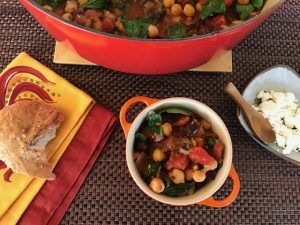 The ingredients that wrap flavor around the chickpeas will whisk you to a sunnier Mediterranean land – fresh rosemary, garlic, tomatoes and meaty dried figs whose sweetness is offset by piquant capers and feta cheese. Dried beans and peas are celebrated these days as a source of plant-based protein, dietary fiber, and essential vitamins and minerals. This recipe is an excellent source of fiber and serves up a good portion of calcium, iron and potassium. Don’t wait for a storm – this stew is perfect for Meatless Monday. Toss it with a chunky pasta – cooked penne, farfalle or fusilli for a heartier meal. Pair it with grilled chicken or lean Italian sausages if meat is a must. I created this recipe for the Valley Fig Growers Fig Focus Newsletter where you’ll find my how-to photos. Like most good stews, this one tastes even better on day 2 and can be frozen for convenience. Serves 6 to 8 (makes about 8 cups). Swirl oil into a large deep skillet with lid. Place over medium heat. Add onion; cook, stirring often, till onion is very soft. Add garlic, rosemary and red pepper; stir for a few seconds, till fragrant. Add chickpeas, tomatoes with liquid, broth and bay leaf. Cover, reduce heat simmer very gently for 15 minutes. Stir in Figs and capers; cover and simmer for 2 minutes. Add greens, remove from heat and stir until wilted. Add salt and pepper to taste, as needed. To serve, spoon into wide shallow bowls. Top with feta. Serve with crusty bread, if desired.